THE WORLD HATES JIMMY - GOOD!!!! I f**king hate my cousin Jimmy. Every day the pug-faced smell-assed c*nt calls me up on the phone and says the same b*stard thing, again and again and again. And do you know what the sh*t-mouthed mother has the audacity to say? He tell's me to stop swearing! I mean, who the hell does he think I am? My mate DC Johnson? The creator of a comic book called... The World Hates Jimmy. 1) What are your own origins, DC? Bitten by a radioactive spider I... I... I... no. Wait, sorry. I’m thinking of somebody else. My first published comic was a shonen style series by the name of “Rx”. It was published by I'm A Geek Entertainment, who I believe went out of business, and then it was reprinted by Wunderman Comics. The art was pretty rough, but it was definitely a learning experience. 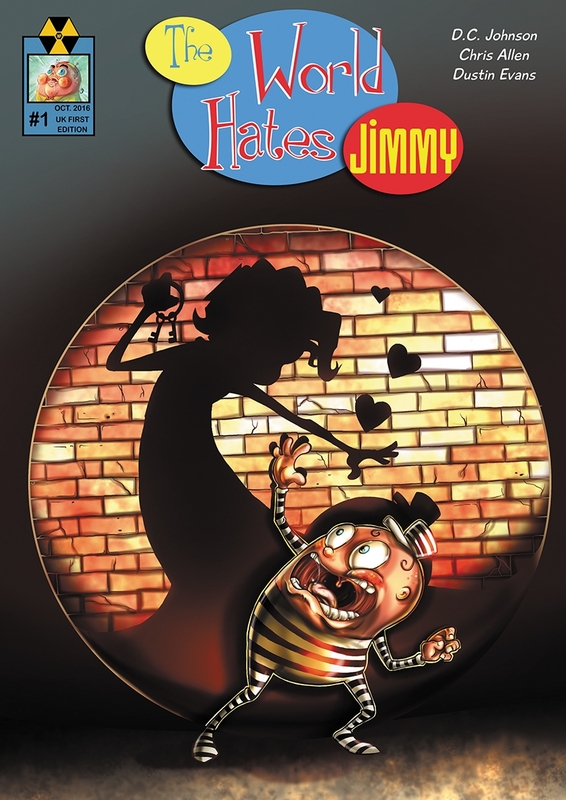 2) What inspired you to create, ‘The World Hates Jimmy’? The comic is based on my life. In 2015, my career as an artist wasn’t going great, and I was poor -- so very-very poor. I wanted to feel like a contributing member of society again, so I took a job at a corporate bank, but literally the day after orientation, a phenomenally crazy girl latched onto me like a barnacle (she later became the inspiration behind the crazy girl that falls for Jimmy in issue one). While I was dealing with her, out of the blue my boss suddenly turned really aggressive towards me. To this day I’m still not sure what I did to offend that woman. But those two catalysts caused a whirlwind of other problems around the office, with me at the center. It was both awful and quite impressive. I had to quit two months after getting hired, Ha! So I sat around my house, unable to get hired anywhere else, and I started to draw... again... and I began to realize that my whole life since High School has been a comedy of errors, which probably sounds like a pretty funny joke if you’re on the outside looking in. So then and there I decided to create a series that pokes fun at everything difficult in my life. 3) In your own words how would you describe this story? At every turn the world goes out of its way to spite Jimmy. He’s more or less not allowed to win. But it never becomes cruel, because it’s not entirely undeserved. 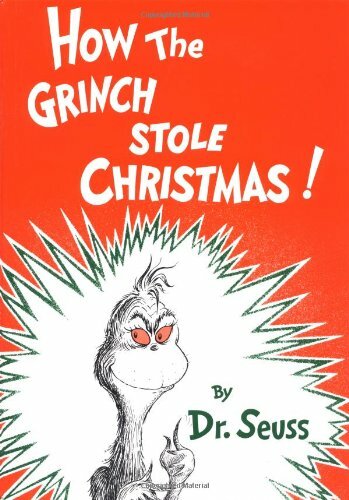 Jimmy annoys everyone around him, and the book is really just his ridiculous reactions to ridiculous dilemmas. 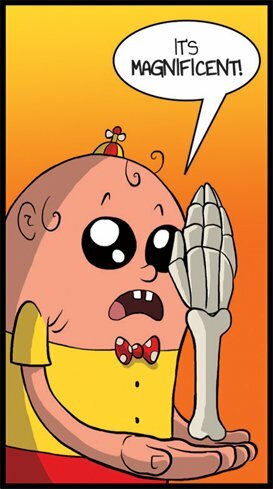 Jimmy himself is based on me, but dialed to ten and lacking all social cues. A personality like that can’t really avoid trouble. 5) What song would you say best represents this comic and why? There’s a song by Motion City Soundtrack, one of my favorite bands, called “Point Of Extinction”. I guess it’s about your breaking point, and how that point never has to come if you don’t allow it to. The chorus goes: “I’m so tired, I’ve had enough, If there’s one thing I’ve learned, You’ll always get burned, But you’ll never give it up”. If Jimmy was a little more self aware, I could see him quoting that. 5) If you could get a celebrity – either living or dead – to promote your wares, who would you choose, and why would you want to choose this particular person? That’s a tough one. Maybe Lewis Carroll or Doctor Seuss: people that specialize in literary nonsense and absurdist humor. It would make me happy if those two in particular enjoyed my book. 6) What have you learnt about yourself through this endeavor? Well, Einstein said “The definition of insanity is doing the same thing over and over again, but expecting different results”. To me though, that sounds more like persistence. So either I’m stubborn or crazy. Whichever it is, I realized it on this book. 7) During your time in this field, what is the one thing that has kept you in good stead? There are a few (arguably foolish) individuals that have not only stood by me, but believe in me to this day. I cannot let them down. 8) If ‘The World Hates Jimmy’ had a motto, what would it be? “I’m still here”. 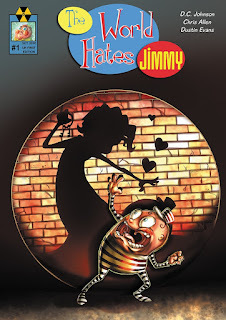 And so on that persistent note, I'd like to thank DC for telling us about his comic book, The World Hates Jimmy, before directing you towards his official twitter account as well as Drive Thru Comics page, where you'll be able to pick yourself up a copy.